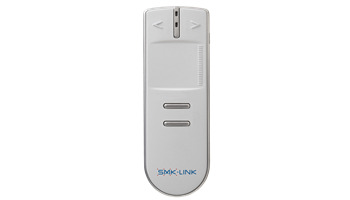 The VP4750 Bluetooth Touchpad Remote from SMK Link makes controlling your computer and your presentations seem seamless. The touchpad makes pointing both familiar and easy. The powerful Bluetooth wireless extends control up to 33 feet away, perfect for home theaters, classrooms and board rooms. The VP4750 shows up as a Bluetooth mouse on Mac and Window computers so no drivers or softwre are required. Overall Dimensions: 1.5" x 5" x 7"